Toyota's seventh and, unless it revives the badge in the future, last Celica was offered between 1999 and 2006. Unlike its predecessors this car didn't offer four-wheel drive or any rallying pedigree. Toyota's seventh and, unless it revives the badge in the future, last Celica was offered between 1999 and 2006. Unlike its predecessors this car didn't offer four-wheel drive or any rallying pedigree, instead majoring on sharp looks and surprising practicality - for a sleek, two-door coupé. Front-wheel drive only, with a high-revving 1.8-litre VVT-i engine the Celica is a canny buy for those wanting a good-looking, fun and inexpensive coupé. After the rally-derived muscle of the Celica's predecessors the seventh-generation's standard 140hp output looked modest. Instead of outright power Toyota pursued 'intelligent engineering' so sought out weight savings and a high-revving naturally aspirated engine with front-wheel drive only. The engine, an all-aluminium unit, is one of two characters: relatively docile and tractable at lower revs, but rapid and feisty at higher revs thanks to the variable valve timing. Reliability is given on the Celica; indeed few performance-orientated cars are likely to give you such a trouble-free ownership experience. To the standard 140hp car Toyota added a 190hp version a year later; it can be visually identified by red badging as well as a more sporting look inside and out. Options were few on all, Toyota specifying all Celicas with a generous equipment list including air conditioning, a CD player and alloy wheels. The rear seats aren't hugely spacious for any but the smallest of passengers, though they fold to increase the boot space - which is surprising useful for a coupé. Changes throughout the Celica's production run were few, though a handful of specials were offered, and in 2003 Toyota increased the quality of the materials inside as well as making a few very subtle styling and specification revisions to the lights front and rear. Otherwise, besides a few Japanese import oddities in the classifieds the Celica was simply offered in those two power outputs. Unless you crave the additional performance of the 190hp cars the 140hp Celica is a decent choice - there are more to choose from, too. Prices differ little between the two, and while servicing costs are likely to be the same, insuring the higher output car is more likely to be more costly. A surprisingly useful sports coupé if you don't need to seat four. 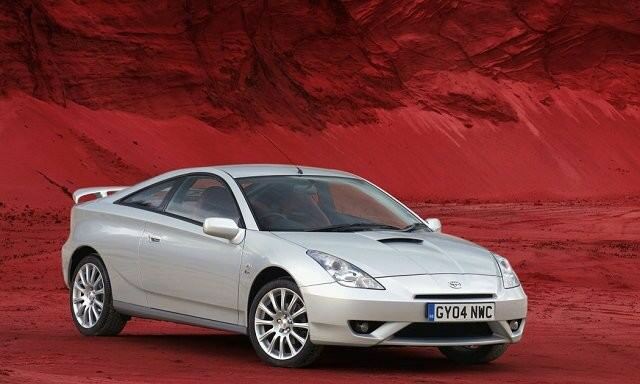 Inexpensive, plentiful choice and bombproof reliability make the Celica an unusually sensible used choice. Still looks great today, too.